The high cultural level of the island is reflected in the everyday life of the Parians.From the traditional feasts and customs to the celebrations of the great religious fairs and local saints, musical and dancing events and happenings predominate the scene.Parians, well-known for their musical and dancing performance, include dancing in all their social events.Of course, there can be no feast without food and drinks.Traditional sounds produced by tsambounas (bagpipe-like musical instruments) and toumbakia (drums), music and dancing escorted by local delicacies, wine and souma, is the recipe for a successful feast. Carnival:Feasts are organised in various nightspots and many local cultural associations organise their own celebration nights.Follow the Carnival fans of Naousa, Marpissa and Paroikia and dance around the traditional Maypole in Alyki. Clean Monday:Feasts are organised in all villages around the traditional supper to celebrate the upcoming Lent.Makeshift kites turn the Parian sky colourful, while children prepare “Mrs Lent”, a doll made of cloths with seven legs – one for each week of fast. Holy Friday:Deposition from the Cross ceremony with Byzantine dignity in the churches of Panaghia Ekatontapyliani and Ai Giorgis on Lagkada rocks.Chickpea soup served at noon in Prodromos.Re-enactment of the Passion of Christ in Marpissa, Marmara, Prodromos, Lefkes and Aspro Horio.It is a custom originating in Marpissa in 1924, when young men and women of the village re-enacted the Passion of Christ during the procession of the Epitafios, with devout concentration.Hours of reverence in quaint Kostos.Late in the evening, the Epitafios processions converge in Paroikia and Naousa.All-night vigil in the Aghioi Theodoroi monastery and in the historical Longovarda men’s monastery. 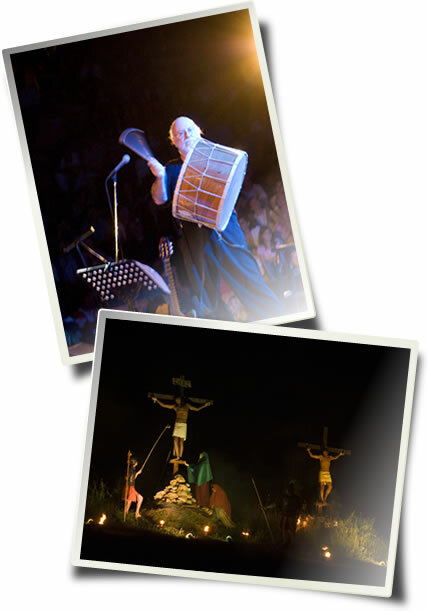 Easter Friday:Zoodohos Peghe Festival in Aspro Horio, with music, dance, food and wine. 8 May:Aghios Ioannis Theologos festival in Drios. 23 June:From 21 to 23 June, the custom of “Klidonas”, according to which the residents start big fires and burn the flower wreath made for celebrating the spring on May 1st, revives in Paros.Jumping above the fires exorcises evil spirits, while, according to another tradition, future husbands are revealed to the single young ladies of the village.The most noted festivals are organised in Prodromos, Naousa and Alyki, with sea titbits and traditional music until dawn. Cultural Festival of Alyki:It takes place every year in June, lasts for three days and comprises events in Alyki, Paros, titled:“GIORGOS KONITOPOULOS”, thus honouring the work and memory of the great musician and composer of the Greek traditional music from Naxos, who chose to live a major part of his life in Alyki, Paros.These events are intended for sending the message that the Greek culture never ends, promoting the Greek music, customs and places, by inviting representative groups of all cultures and styles from all places in Greece. 2 July:The Fish and Wine Festival takes place in Naousa.This way, the locals honour the sea and land that provide food to so many families all these years. 17 July:Revival of Tsambouna in Naousa. 24 July:Aghia Anna feast in Paroikia. 6 August:On the day of “Metamorphosis of Sotiros” (Transfiguration of Christ) in Marpissa, the “Fish Festival” takes place in Alyki, as a tribute to the sea and fish that give food to dozens of local families. 15 August:The greatest feast of the Orthodox community is celebrated with special reverence in Paros.The mass is performed with glory in Panaghia Ekatontapyliani, while a great procession and litany of the Virgin Mary’s icon takes place in Paroikia in the afternoon.In the evening, the Paroikia beach is lighted up by the impressive fireworks and the ships participating in the festivities to honour Virgin Mary.A festival full of music, dance and abundant wine and food starts. 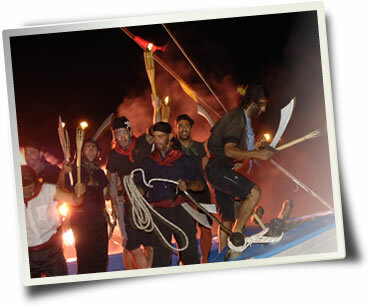 23 August:The Pirates Festival in Naousa is the re-enactment of Barbarossa and his pirates’ raid to Naousa in 1535. During such raid, women from Naousa were stolen and a great fight was given to get them back. 27 August:Aghios Fanourios feast.A festival with dance and music in Ambelas. 28 & 29 August:The Aghios Ioannis Detis Festival in the relevant monastery located in front of the Naousa bay (inside the Environmental and Cultural Park) and the “KARAVOLAS” feast in Lefkes offering a special gastronomic experience to visitors. Early September:Trawl Fishing Festival in Paroikia. Early September, on the Sunday before the Holy Cross Feast: Feast of Aghios Chrysostomos from Smyrni, including an event dedicated to Asia Minor, with traditional dances, happenings and songs from Asia Minor. 8 September: Pera Panaghia Festival in Marmara. Autumn:Souma (local wine) festival.Local sausages and chops, octopuses and fresh squids are grilled around the fire of the souma cauldrons.Parians taste the new souma and the local titbits.Under the sounds of traditional music, they celebrate, sing and dance.This process is a great opportunity for organising a small festival. “Routes in Marpissa”:It is a three-day experiential cultural festival that takes place in Marpissa, Paros.The festival is based on the idea of creating thematic trails in the traditional Marpissa settlements, on which actions take place throughout these three-day celebrations.It is organised based on an experiential approach to the activities, so that each one takes active part in the happenings.“Routes in Marpissa” were born out of the vision of a group of volunteers of various ages and occupations who, joined together by their love for that place and their will to offer, attempt to highlight the authentic character of the island and its inhabitants.This initiative is aimed at encouraging team spirit and action-taking by locals and visitors, improving social relations and developing the participants’ creativity.The organisational team comprises about 50 volunteers of various ages and occupations:Architects, graphic designers, teachers, philologists – translators, musicians, artists, public relation experts, programmers.For more information and the time plan, please visit www.stimarpissa.gr! Throughout the year and mostly in the summer, the local cultural associations and the Municipality of Paros organise many cultural events:concerts, theatrical plays, sports events, painting and sculpture exhibitions, art workshops and much more.